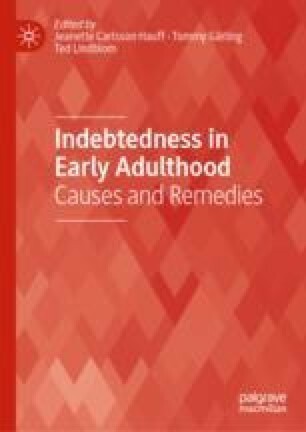 From a Swedish perspective, different types of credits and loans relevant to young adults are analysed, together with an assessment of levels of indebtedness. This enables an assessment of the level of urgency regarding the Swedish market and a discussion of whether the recent development of the Swedish loan market follows an international trend. The level of indebtedness of Swedish young adults is compared to the general population of borrowers. The efforts taken by Swedish authorities are discussed, something that may serve as a description of one way to tackle current societal challenges. The Swedish example, containing strong macro-prudential initiatives, could be seen as an example of a legislative way to tackle problems associated with a potential housing bubble and high debt ratios. Intrum Justitia. (2017). European Consumer Payment Report. Available at https://www.intrum.com/globalassets/countries/the-netherlands/consumer-payment-report/intrumjustitia_ecpr2016_en.pdf. Riksbank. (2018). Repo rate raised to—0.25 per cent. Press release. Available at https://www.riksbank.se/en-gb/press-and-published/notices-and-press-releases/press-releases/2018/reporantan-hojs-till-025-procent/. SBA. (2017). Bank and finance statistics 2016. Available at https://www.swedishbankers.se/media/3582/1711_bank-and-finance-statistics.pdf. SEA. (2015). Sms report. Available at https://www.kronofogden.se/download/18.15b50db11571e6de914281a/1475579641849/snabblan_rapport_helar_150209.pdf. SFSA. (2017). Hushållens räntebindningstid—en ekonomisk sårbarhet? Available at https://www.fi.se/contentassets/1dcc1e4d818c4751aeb56d3265ee2e16/fianalys9_hushall_rantebindtid_20170310.pdf.